GAO-15-545: Published: Aug 7, 2015. Publicly Released: Sep 8, 2015. 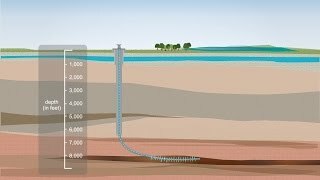 How water is used in the process of hydraulic fracturing. 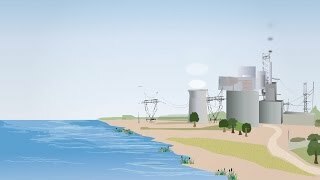 How water is used in thermoelectric power plants. Waterless and water-efficient fracturing technologies such as gas-based fracturing or foams have been used to reduce the use of freshwater in hydraulic fracturing operations, although the main benefit is enhanced hydrocarbon recovery. The geologic formation characteristics of shale plays largely determine their use. According to experts GAO consulted, hydraulic fracturing operators are managing their water resources more efficiently—for example, by treating produced water for recycle and reuse—as an important part of their overall strategy to reduce cost, improve operational efficiency, and reduce the demand for freshwater. Dry and hybrid (wet-dry) cooling systems are mature technologies to cool thermoelectric power plants, and are highly efficient in terms of water usage. However, these technologies cost more than conventional wet cooling systems and can result in an energy penalty that requires more fuel to be burnt per unit of electricity produced, thereby reducing the net electricity output from the plant. Some emerging cooling technologies which may help reduce water use in wet recirculating cooling systems are at the prototype or conceptual stage of development, and their effectiveness at saving water for power plant cooling applications is still uncertain. The regional distribution of electricity generation using different types of cooling systems, fuels, and generation technology—the combination of which largely determine a plant's overall water usage—reflects water stress conditions to a certain extent. Options for plants to switch between various types of cooling systems and generation technologies are limited or have drawbacks. In the most water-stressed regions, there is an emerging trend of new construction natural gas combined cycle plants that also use dry cooling technology, a combination which is both energy and water efficient. Many regions within the United States experience moderate to exceptional drought forcing state officials to make difficult choices regarding energy and water. Competition for freshwater continues to increase due to industrial, municipal, and especially agricultural and energy sector demand. The thermoelectric power industry, for example, accounted for 38 percent of all freshwater withdrawals in the United States in 2010. GAO has issued a series of six reports on the interdependencies between energy and water. In this report, GAO assessed advanced and emerging technologies that can reduce water use in hydraulic fracturing and thermoelectric power plant cooling. GAO also examined the impact of regional differences in thermoelectric power generation on water use in water-stressed versus unstressed areas of the United States. To perform this technology assessment, GAO reviewed relevant peer-reviewed scientific literature and government reports and consulted experts with a wide variety of backgrounds and expertise. Experts convened with the assistance of the National Academy of Sciences advised GAO, and reviewed a draft of this report. GAO incorporated their comments in the final report as appropriate. View GAO-15-545 or key components at www.gao.gov. For more information, contact Chief Scientist Timothy Persons at (202) 512-6412 or personst@gao.gov.